"On behalf of the staff, volunteers and patrons of Great Waters Music Festival our thanks and congratulations to Jim Fontaine, the architect behind our new user-friendly website that immediately saw an increase in page hits, customer inquiries and most importantly, ticket sales!" 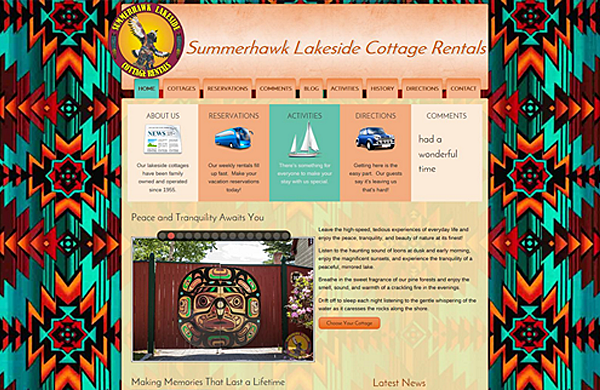 The owners of Summerhawk Lakeside Cottage Rentals, located in Wolfeboro, NH - The Oldest Summer Resort in America - wanted a CMS-enabled website with a southwestern flair that echoed the decor that's featured in each of their well-appointed lakeside cottages. A family owned and operated business since the 1960's, generations of families have made memories to last a lifetime during their lakeside vacations at Summerhawk. A mobile-friendly, responsive website design makes it easy for travelers using their mobile devices to find and interact with this website. The owner continually shares e-mails with PCS Web Design from their patrons who love the look-and-feel of their new website that sports a little bit of the Southwest right here in the Northeast! 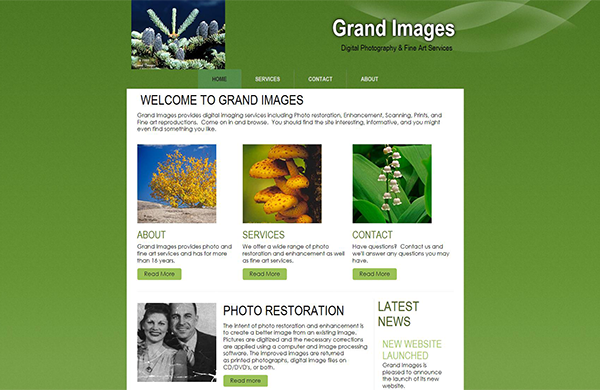 Grand Images had a very old website that they had built themselves. It was functional but didn't accurately portray to level of professionalism the owner wanted to convey to his clients and potential customers. PCS Web Design worked through multiple design iterations in create both a visual look as well as a custom navigational structure that embodied some very particular ideas the owner wanted to see. The result is a clean, modern, CMS-enabled website that now shows the breadth and depth of photographic services they are able to provide. A picture's worth a thousand words. And, sometimes, pictures are better with words. 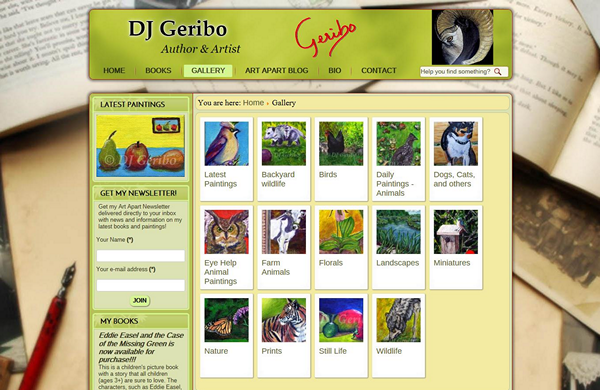 For New Hampshire author and artist, DJ Geribo, both came together in the CMS-enabled website built by PCS Web Design. The author and artist's books and paintings are both available for purchase directly from the website as well with ecommerce support. DJ also blogs about what she's reading and what she's painting. Social media links keeps her art patrons and book fans up-to-date with upcoming art exhibits and shows as well as book signings. You can also signup for her newletter from her website. This website has it all! 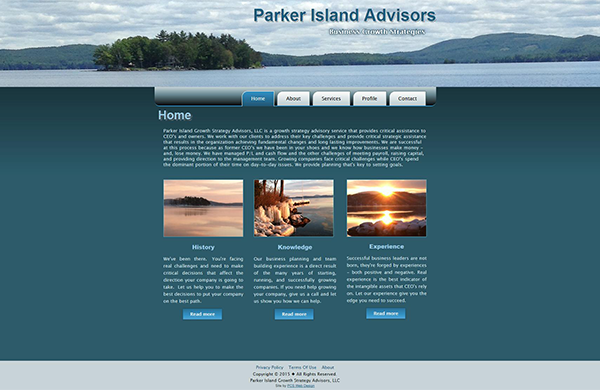 Parker Island Growth Strategy Advisors, LLC contacted PCS Web Design to discuss building them a website that would accurately portray their services. A minimal design and pleasing color palette built around images provided by the owner was the focus of this basic business website. The results demonstrate the truth behind the saying that sometimes "less is more." If you have a business or product that targets a niche market, perhaps a less is more approach would work for you as well. 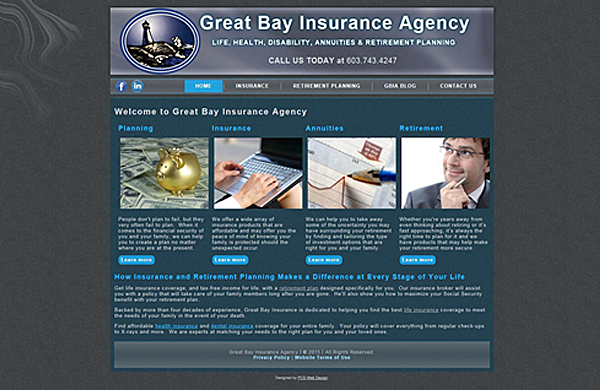 Great Bay Insurance Agency's owner, Sandy Salava, came to PCS Web Design when he was faced with some pretty challenging obstacles to the agency's existing website. Issues surrounding his domains registrations and hosting threatened his online presence with completely disappearing. PCS Web Design was able to work on behalf of the owner to secure the transfer and ownership of a second-choice domain as well as subsequently secure the transfer and ownership of an original domain name to their control. Regaining control of the original domain saved the owner time and money because it allowed him to use existing promotional materials and sales collateral printed with this domain. Concurrently, PCS Web Design built a responsive, mobile-friendly, CMS-enabled website to replace their outdated design. Sandy makes it a point to connect with his clients personally and his new website let's him start that conversation off on the right foot.